This claims to be Junior Johnson's family recipe. If you're unfamiliar with Junior, he was one of the NASCAR greats back when stock cars were actually mostly stock cars. 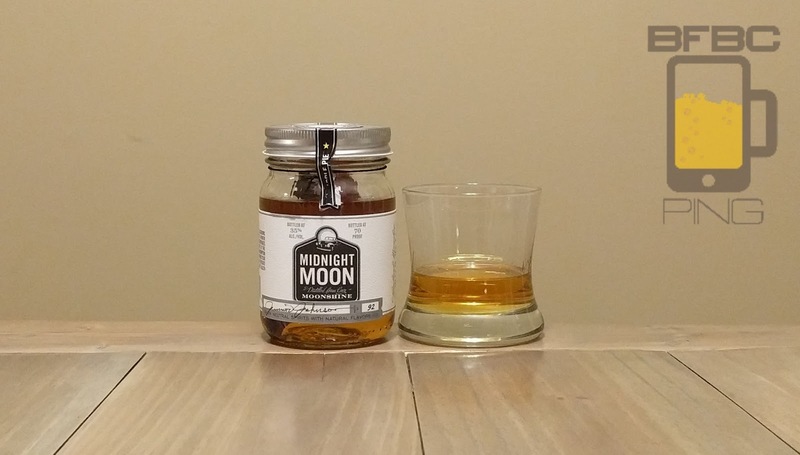 As NASCAR started its life with moonshiners comparing their cars, this is supposed to have some legitimacy - it even says it is made using corn, and that is (at the very least) the correct ingredient for it. The beverage appears like a syrupy Juicy Juice apple juice. So, it is pretty much what you'd expect. My initial reaction when I opened the jar was AHHHHGH! What the hell is that overpowering acetone smell? Well, I still don't know what it was. Maybe it was something to do with the jarring process (please note that this is not a usual Mason jar - it's a sad copy) because I now can only smell heavy alcohol, apples, and cinnamon. So, maybe everything will be okay. First sip is very strong. The alcohol absolutely overwhelms the mouth, but I still get apples and... cherries? Why am I tasting cherries? I mean, I like cherries, but I didn't expect them in an apple pie. Of course, my taste could be screwed up by whatever that was when I opened the jar, so I'll go in for a few more sips. The beverage would not easily be confused with actual apple pie - not just because it's liquid instead of solid (well, mostly solid). The alcohol stands above everything and yells down saying, "Oh, did the girly man want a sissy drink? Get your umbrella drinks somewhere else! I'm MOONSHINE, dammit! I'm supposed to be gruff and abrasive!" And, to be honest, it really is what it is supposed to be. Bottom Line: Challenging like driving against Junior Johnson, and that means a victory isn't likely. This review is going to be a little different from my usual movie reviews. The Purge is a movie about an alternate version of the United States where one night a year they have an annual "purge" where violent people can purge themselves of their desire to hurt other people, and the poor and homeless can be eliminated from public concern; killing homeless people is encouraged. The main character, played by Ethan Hawke, is a salesman for a home security company whose home come under assault by a group of evildoers. The issue I have with this security system that he installed, and that's what I'm going to be reviewing here. The system was described by Ethan as being 99% effective in testing, but it was not designed for worst case scenario. He casually mentioned that someone could tunnel underneath to get to them. Clearly, it didn't take that much. Let's look at his controls one by one. The extra special bitter is weird kind of beer. I've only had two other beers that claim to be ESB's and they were both good, but that's a pretty small sampling considering by breadth of experience over the many years of this blog. But, this is an ESB that even claims to be "easy" to drink. Let's find out if the right. This mostly murky beer has a definite red hue to the otherwise honey color. The head is a light tan, and it is aggressive as heck. It doesn't seem to leave a bunch of lacing, but it asserts a large number of bubbles right out of the bottle to the point that I needed to let this settle twice in order to get this picture. The aroma is rich and bitter like a wine that is at the verge of being off. I didn't like the previous beer that I got from these guys, but I like the cut of their jib, so I'm going to keep giving them tries for now. This one is an IPA, but it's an imperial IPA. Imperial Stouts and Imperial Porters have been around the edges of the styles that I like, but they are generally a little stolid and unapproachable. I'm hoping the Imperial IPA won't be. The head doesn't stay around for long, but it's a little off-white while it's there. The beer under it is a pale straw-orange color with the aroma of citrus and grains. Oranges and apricots seems to be forward with pears and wheat in tow. First sip is much more harsh than the aroma made me believe. It's tart and very bitter, but it has a dust of funk and a very forward yeast. All together, the beer is somewhat caustic and antiseptic - strangely not what I'm looking for in a beer.